The snail really has three parts, shell, body and base. 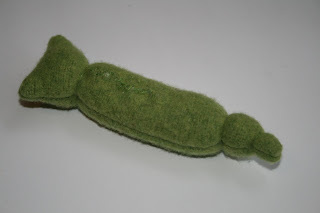 You will need a strip of felted jumper or sweater approx 7 cm x 40 cm. I just guessed this and cut it freehand. Turn over a small fold at the top and begin to curl up your shell tucking in the first raw edge so it doesn't show. 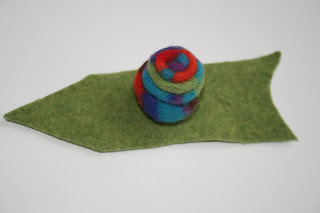 NB: To create the two toned snails I just sewed two different coloured jumper strips together and went from there. Keep rolling , with each turn just below the top of the one previous - like a spiral, stitching it in place as you . The felt is lovely and thick so it is very forgiving of bad hand sewing (trust me). When you have your shell measuring approx 6cm across it will be big enough. Taper the felt so that the end tucks under the bottom. 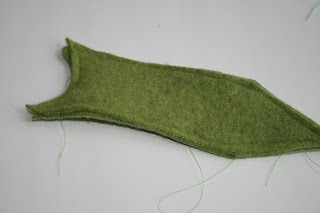 Run a few stitches across the bottom to pull it in neatly. Check out the freehand cutting here as well. Cut two body pieces in this elegant shape measuring approx 20cm x 7cm. 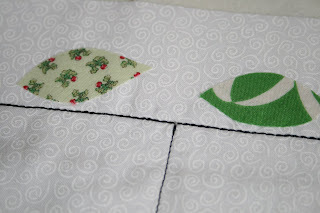 Sew all the way around using a small 1/4 inch seam allowance. With pointy scissors , cut a small slit in the centre of the snails body and turn it through the slit. Stuff your snails body and sew the slit closed - Don't panic about this as it will be covered by the shell.Using embroidery thread, wrap it around the body to create tails segments (do snails have tails?) and also a head - GO WILD!!!! Secure your threads. Add some eyes. 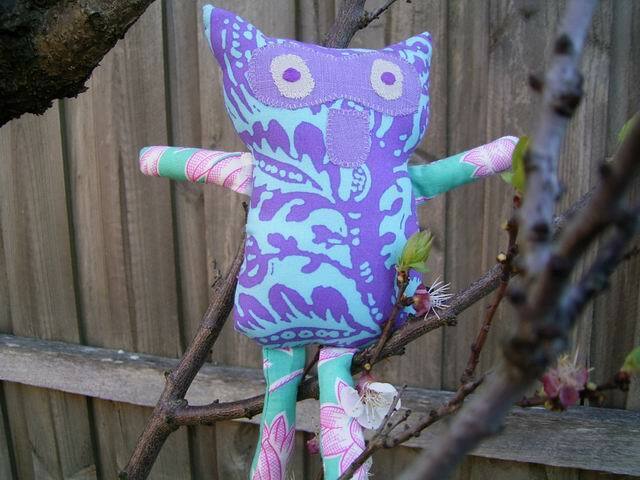 I sewed on a weeny circle of felt and a tiny bead - I was confused about a mouth so I just left it out! She is looking somewhat stunned here. Then simply sew your shell to your body. 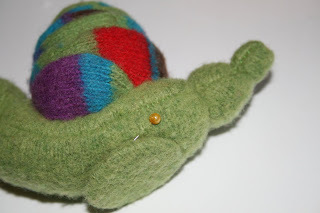 Depending how far up the shell you sew, you can give your snail a bit of curve - it won't matter as he will be getting a firm base to help him stand. You will need a small thermoplastic circle measuring 3cm across (if you have no templastic, just use a piece of old folder, or an ice cream container). 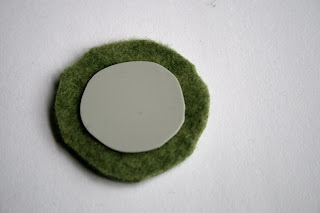 Cut a piece of felt to match your body about 1cm larger than the plastic circle. 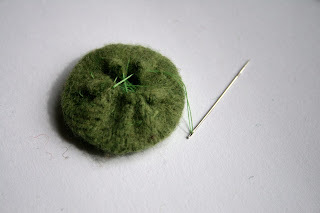 Run a gather stitch around the felt and gather up - a bit like a yo-yo only with the plastic inside. Secure your threads. 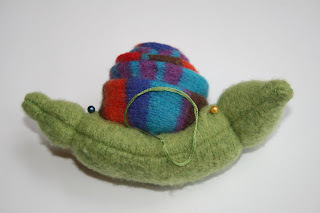 Pin the base to the bottom of your snail and check for balance - fiddle around until you find the right position so he can stand........ Stitch it on and then, if he can stand ....he can race! I made this mat to go with the snails. I think it would be a great gift for little kids - you just need to add some dice and away you go. yes OK, My youngest is almost 14 but ....ummm...well I like it!!! The mat is approx 120cm x 45 cm. I used some white cotton and drew the grid on with a fabric marker. 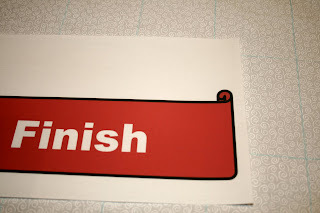 The finish line I created in word and printed out on Matilda's Own ink jet printable fabric - you could do the same for the numbers but I had some on fabric already. I added a batting layer of flannelette - the idea is that the mat needs some weight so it can sit nicely on the floor but can't be too puffy or the snails will topple over. Then I sewed the grid with black thread, using a triple stitch so it is nice and thick. Everything else gets Vliesofixed in place ( the same sort of thing as wonder under or double sided applique adhesive) and then stitched. 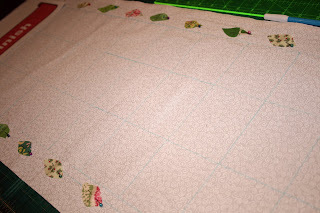 Once everything is where it should be - just add a backing. 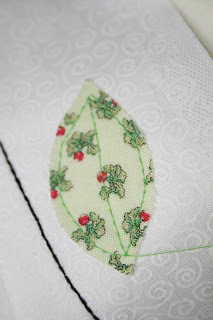 I sewed it up and turned it all out through the gap , rather than bother with a binding. 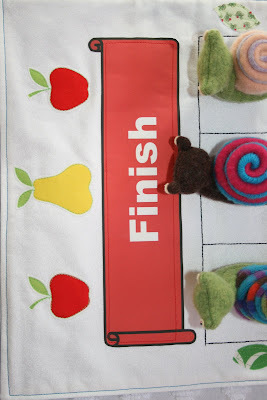 The fruity finish line was cut straight from fruity fabric and added the same as the rest. If you made this as a gift you could also make a dice and have doubles of the numbers 1, 2, 3, so the game lasts a bit longer. Or you could just make a really long racecourse!!! In a photo finish- I think Corduroy won by an eyeball. I love the racing game! As usual you have left me stunned with your creativity! This is the best yet. Fantastic tutorial and awesome racing mat!! Looks like the brown snail won by an ear? ARE YOU KIDDING ME?! This is the cutest thing EVER!!!!! ....and I now know, what to make for my 3 year old daugther for Christmas! This is perfect!! ack - that's too too fab. Love it! 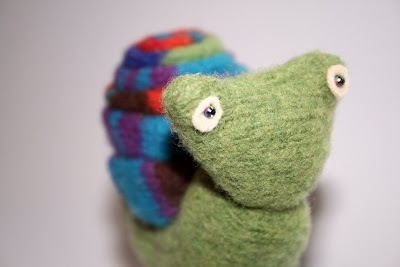 I'm off to bed straight away, so I can get up in the morning all fresh to make some racing snails!! Well I wonder what the kids friends will be getting for Christmas this year????? What a fantastic idea, well done Jodie! These are absolutely gorgeous - thank you so much for the tutorial. I have no idea how to felt but I have been meaning to find out and this has definately motivated me to hurry up and do it! 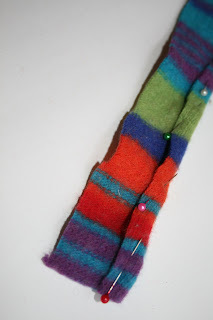 Another wonderful,quirky and fabulous tutorial-thanks for sharing. TWO tutes, the big crazy selvedge project, a family, work, breathing.. How do you do it??!! So darn cute! congrats to Corduroy! and you too for your wonderful creations! Wonderful tutorial. And I love the snail race. Reading your blog always makes me laugh. Thanks. SO cute! And I can always use an excuse for crappy sewing! I think he won by an eye stalk. Girl you are crazy! Crazy crafty and just out of this world! You even made them a race track game, I love it! Absolutely fan-flipping-tastic!!!! 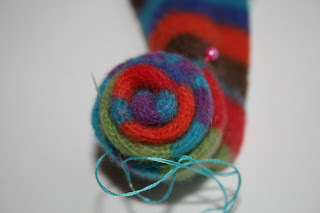 I've got to make these for the Little Lockets because we always used to do snail racing in the front garden! You are brilliant Missus RicRac!!! I have this image in my head... you and some friends with a few bottles of wine and this game!!! It's fabulous and the snails are so much fun. I love your solution for the eyes too. Jodie... you are clearly a genius... and way out in front, like Corduroy! I am in love with this whole idea! great tutorial! These are amazing! I love the race! OH Jodie, that is adorable!!!! You CUT a snail's body? :-O Didn't it ooze everywhere?! this is a really fab idea!! Wow - sooo fabulous! Thanks for putting this tutorial together and sharing. You rock. This would have to be one of the cutest things in the whole wide world!! I love it! Wow!!! Love the snails, they are sooooo cute. Well done Jodie, I may have to try some myself. How exciting getting your first quilt back!!!! awesome. what a rocking gift Jodie. thanx for the tut. Ingenious! What a darling idea. It is all done so well. Jodie you have such good ideas and skills. Oh, that is just the cutest thing I have ever seen! Thanks for the tutorial:) I have a feeling I may end up with snails all over my house. These are so cute. I will definatley have to make one for Caleb for Chrissy. I have been flat out with some deadlines for the week, but I will get your selvedges in the mail Monday, Sorry for the delay. I want a piece of your creative brain! Love the snail race - loveit! Jodie this is awesome!!! Where on earth do you find your inspiration??? Absolutely fantastic! I love it so much! Love, love love your snails!!!! This is great creation! great job as usual - love racing snails there should be more of them. maybe when I finally get to unpack all my craft stuff again. These are so cute. I love the little racing mat. Winter is on the way here in Canada so I will be doing more sewing. Hope you are doing well! Aww, how cute is that!?! Love the racing mat. I'll be linking to this project! 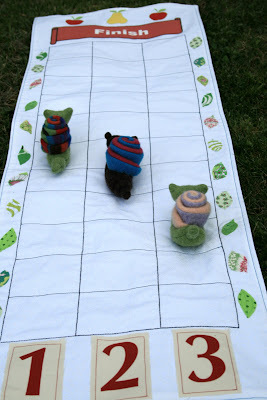 Your snails are so cute and I love the idea of making them a race track. Too fun! I think that snail going be so cute by my mushroom thank you so much for the tutorial. Oh these are just too cute!!! Complete with little game too. You are just too good Jodie. I think this is far better than twister!!! How damn cute... You are a true whizz. aww thats really brilliant, and I love how you made the racing mat to go with it. Thanks so much for the wonderful tutorial! As usual, you have brought laughter and joy to my corner of world (Chapel Hill,NC,USA). As kids we used to race real snails on the bonnet of my Dad's old Falcon. I'm sure he would have been grateful if we'd had your brilliant racing track!! The snails are so cute. I will be adding this to my to do list, most definately! They are the cutest and they're not guuy if that's a word. But I love them and I could touch them. What a brilliant tutorial. The snails are fantastic. Love this blog! Lovely! Reminds me of the real snail racing we did as kids. I think this might have to be someone's Xmas present. OMG this is the cutest board game ever! I LOVE the snails! Great tutorial and great game. I must make some of those snails! How lovely! I can't abide slugs, but I do like a snail. i'm oficially your stalker! i loose these little snails. i will have to give them a try! 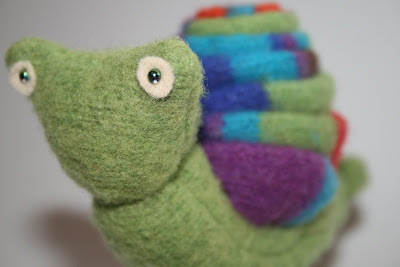 You found the most wonderful jumpers for these snails!! You must live near a great second-hand shop. Thanks for sharing, I love them. Lovely! I've got to try! In Sweden we have a boardgame with snails that reminds me of your game. With snails in different colors and a dice with colors (same as on snails) instead of numbers it's easily played by 2-3 yearolds. The snail with the same color that comes up on the dice gets to move one step forward, regardless of who threw the dice. First over the finishline wins of course. Jodie you rock and my sweet little Frog Princess is obsessed with snails -- I just may have to make one before Christmas or I may save it for her birthday in March!! Brilliant...I know 3 little boys that will love this! (mine lol). I am so a grown-up! I owe it all to Annie.